Every time when you watch Christmas films you expect to see a big family gathering around a table to eat freshly made holiday feast. Sometimes, they might have a little fight before the big celebration night, but that is always important in order to appreciate each other even better. 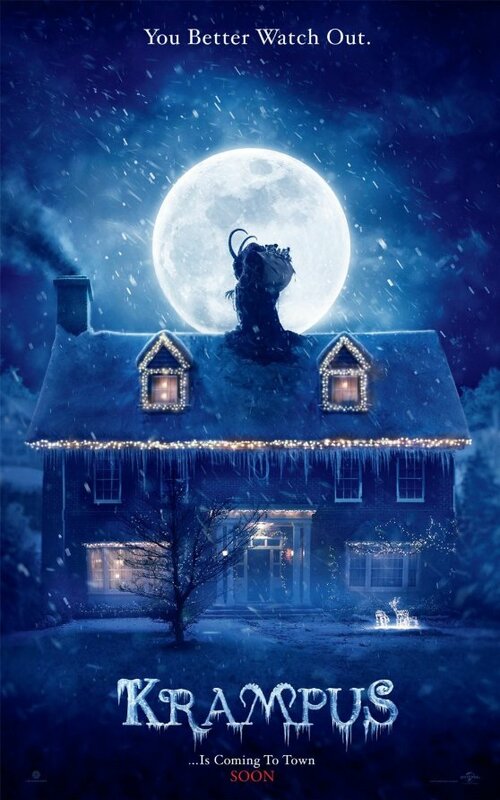 However in Krampus, directed by Michael Dougherty, you see something different than you’ve ever seen before. One family comes together to share the same Christmas spirit, but instead find themselves hunted by terrifying creatures, that takes out one family member after another. Krampus centers around the Engel Family, particularly, Max Engel, who has a bad Christmas. His cousins make fun of him when they find out that Max wrote a letter to Santa Claus. After being disappointed, angry, and absolutely alone in his attempts to make his Christmas better, he tears his letter into many pieces and throws it out of the window. But surprisingly his letter flies up and disappears into thin air. Shortly after, strange things start happening. If the power outage did not bother the family at first, what happens next could not leave them indifferent, as they started their fight against the unknown scary monsters, that seems are on a mission to take the entire family away. As the film progresses, you see Max having issues with his family members. But his German speaking grandma reveals the story that happened with her many years ago, when the same occurred to her. What you find out after she ends telling her story is glaring, and makes you fear more for Max’s family. By the time when you reach the middle of the film, and the half of his family has vanished or been killed, you realize that this is not a typical Christmas film you’re watching. However, the time passes so quickly you don’t really pay attention to anything, as long as you get your happy ending, if there’s any. Mainly I liked the approach of the film. It’s quite a unique way to reunite the constantly bickering family on Christmas day through the horror that’s accidently been triggered by Max. You know that our little hero had no intention to harm his family or his cousins or to have such a terrible fate, but by the time when the little boy realizes what he had done, he does his best to undo it. Of course, such a radical way of bringing the family together is not what you expect in one film, but if it works, and it works perfectly fine, why can’t we just relax and allow ourselves to get scared, maybe not too much, but enough to make your Friday evening fulfilling? In conclusion, Krampus is a pretty straightforward horror film with an element of comedy. It develops the characters well, leaving us no questions at all. While there is no big acting ability required in this film, the actors still deliver a solid performance. In the end, after you watch this film, you will learn how important it is to be more careful what you wish for, especially, if you’re at the age of eight or younger. Christmas is a great opportunity to let your family members know you care about them. And before you decide to write a letter to Santa Claus, and afterwards to tear it into pieces due to your anger, and throw them out the window, watch Krampus and see what happens next. Perhaps, after that, you may change your mind, if it’s not too late… So, don’t tell me you were not warned.